Democrat Ian Calderon currently represents Assembly District 57 and will not be termed out until 2024. Calderon is expected to win re-election in 2016. Ian Calderon was elected in November 2012 to represent California's 57th Assembly District, which includes the cities of Industry, La Habra Heights, La Mirada, La Puente, Norwalk, Santa Fe Springs, South El Monte, Whittier and the unincorporated communities of Avocado Heights, and Hacienda Heights. Prior to his election to the Assembly, Calderon worked for Hurley, a surf and sportswear company. As manager of the marketing department, Calderon supervised market surveys and research, and promoted company events. In addition to his career in the private sector, Calderon also served as a field representative for the State Assembly, which allowed him to assist residents in his community with various issues. In this capacity, he was able to help constituents gain better access to resources, and helping them understand how legislation would affect them. 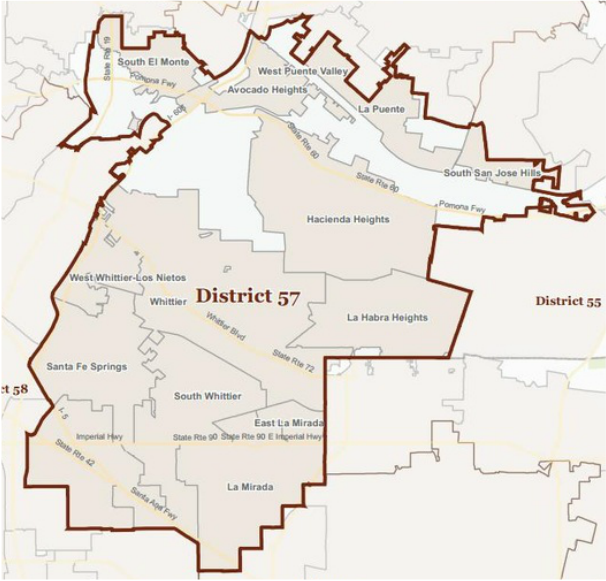 Calderon’s interaction with residents of the 57th Assembly District solidified his decision to run for the State Assembly as he had witnessed first-hand the need for new, unique ideas in Sacramento. Calderon, who grew up in the 57th Assembly District, comes from a family that has a long commitment to public and community service. His commitment to public service was inspired by his grandmother, Rita, who struggled and sacrificed to provide a better life for her children and the community in which she lived. Calderon graduated from California State University Long Beach where he earned a degree in Political Science, providing him with knowledge of California’s political landscape and an understanding of the State’s most critical issues. Calderon, like his father Senator Charles Calderon, believes that if the California dream is to be kept alive, the state needs leaders with new ideas and fresh perspectives who see a California filled with promise and opportunity.